Known worldwide for its exceptional implementation of menhirs and dolmens, Megaliths Coast is also a popular destination for its beautiful seascapes. At the seaside you can find south facing sandy beaches. 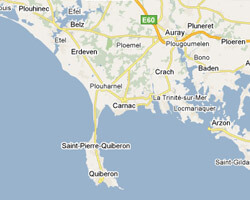 It contains one of the most famous seaside resorts of southern Brittany: Carnac. 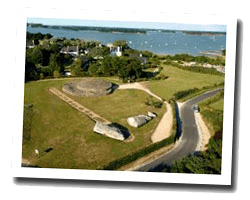 On the Megaliths Coast enjoy a seaview holiday rental. 6 rooms villa 175sq. m. Garden 1500sq. m with outdoor furniture, deck chairs and barbecue. 5 Bedroom(s), 3 double bed(s). Final cleaning : 65 €. 3 rooms Apartment 70 m2 on the 1st floor in the "Men Er Bellec residence". Terrace with outdoor furniture. View of the sea. Located in Saint-Philibert, this holiday home offers a terrace, a garden and views of the sea. Free WiFi is provided throughout the property and free private parking is available on site. 6 Bedroom(s), 4 double bed(s). short stays possibility. Final cleaning possibility. Spacious apartment in a house with sea view in all rooms. The cottage offers the advantage of sea and countryside. 200 m from small coves. 5 rooms house. Balcony, terrace, garden with deck chairs and barbecue. View of the port. 5 Bedroom(s), 3 double bed(s). short stays possibility. Apartment with large balcony, views of the harbor.